I'm impressed and I'm a cynical old engineer. "Pioneer Airlines" is an in-house Embraer operation that simulates actual airline operations, flying with typical airline utilization and turn times to ensure the reliability of the aircraft prior to EIS. More than 600 dedicated maturity flight tests were conducted after the aircraft was certified to ensure that the systems delivered to customers were performing at mature levels." "With the E2 programme, Embraer will be able to address a wider market than it could with the E1 programme, said John Slattery, president and CEO Embraer Commercial Aircraft, speaking at a pre-Farnborough media day in Lisbon. 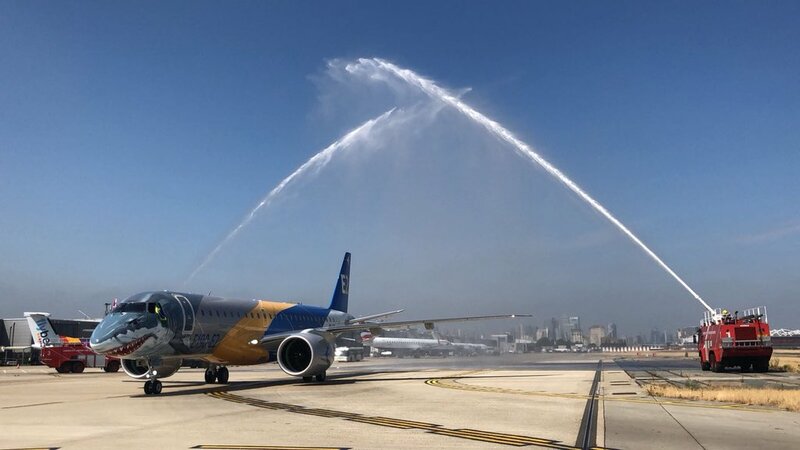 Embraer has delivered the third E190-E2 aircraft to Widerøe and the E195-E2 is on schedule for the first half of next year with launch operator Azul, Slattery said, while the E175-E2 is to enter into service in 2021. With the potential to address a wider market through the E2 programme, Slattery suggested that the E175-E2 for example, could win “some of the turboprop market” particularly those operating longer than 300 nautical miles. He also highlighted that Embraer is not building the E175-E2 exclusively for the US market, but expects to see sales in areas around the world such as Northern Europe, the Indian subcontinent and China." "Embraer is correct in its view on “right-sizing”, as it has become apparent that using larger Airbus or Boeing models often doesn’t generate the lower costs airlines seek. Airlines either end up having to cut back flight frequency or deal with lots of empty seats. The market wants frequency but, often, the market doesn’t generate enough traffic. The argument that staying with one aircraft type to achieve economies of scale has limits as well. Airlines often deal with these tradeoffs by “mis-using” their aircraft. With the new generation of “crossover jets”, these tradeoffs are no longer necessary." E175-E2 has no chance in those areas. The only market is the US for this aircraft. Could you elaborate please ??? The E2-175 must have a MTOW over 86,000lb. The wing and engines added too much weight. Look at the sales of the E1-170/175. This is an industry that thrives off economy of scale. 42% of the planes are flown for the US regionals. Without the large orders of US regionals, the type will struggle. Of the new generation engine aircraft, only the MRJ-70 meets the 86,000 lb guideline. Will that be enough? The only order for the E2-175 is an operator who cannot receive the aircraft. That alone should be sufficient explanation. No lessor will fund the E2-175 will the loss of possible resale to the US market. Why didnt Embraer make the E175-E2 with the weight limit in mind? If it was under the limit they would have hundreds of orders. I dont get why they didnt think of it. Mr Slattery seems to talk a lot and he is not able to boost the E2 backlog with new sales. The last E2 sale was to Wideroe in January 17, a long time ago. I agree with EMBSPBR: the 175E2 has market outside the US, but it depends on the oil price. You're really reaching with a couple of these airlines. I'm willing to bet the E190-E2 and E175-E2 are going to have similar operating costs and the E190-E2 is going to have much better CASM. We have to remember that with these re-engines and improvements, the smaller aircraft are really going to be hurting, (B37M, A319neo, A338 and etc). I believe that all these airlines you have listed have a MUCH better chance at ordering the E190-E2. Remember the E175e2 doesn’t share a wing or the exact same engines with the other models. I'm aware of that, it also has a very slightly different engine which shouldn't hamper commonality much. We have to remember that airlines want to be able to have future growth. The E175-E2 is only enlarged by 1 row. Will Embraer look to certify the 175-E2 at LCY - I presume so, but unsure if this has been confirmed? That will be critical to BA and potentially others ordering the type. Also FlyBe have ruled out further orders. Why he should do the opposite ??? "Advertising is the soul of business ..."
The last E2 sale was to Wideroe in January 17, a long time ago. Last sale was on June 2018 at Paris Air Show. As soon as the operators are announced they will enter the order list. This is a company policy.In fact, one of the operators, who is already working alongside Embraer, will be the first in the next year to count on the first class staggered concept in individual seats. "Brazilian manufacturer Embraer announced firm orders and commitments for 38 of its E-Jet family aircraft from six customers at the Paris Air Show June 20, valued at over $2.2 billion at current list prices. From two separate undisclosed customers, Embraer booked a firm order for 10 E195-E2s (which also included purchase right options for an additional 10 aircraft) and a commitment to purchase 20 E190-E2s, also with purchase right options for an additional 20 aircraft." PIPs reduce the cost per flight difference between shrinks (E2-175) and stretches (E2-190/195). Thus every improvement shifts orders to the larger model. There has yet to be an order for the E2-175 outside the USA despite years of sales campaigns. It speaks volumes that there is no viable launch customer. Until there are multiple orders, customers will wait. The fate of the E2-175 rests with DALPA. If DALPA increases scope for DL, the E2-175 and MRJ-900 have a substantial market. If DALPA decides the offer isn't worth it, both will struggle. Any which way, the E2 needs orders. Farnborough will be exciting. It is really weird that a year later the order hasn't been firmed. You neglect the Moxie order, a public order only dependent on Neeleman securing $100 million or so more in financing yet tout orders that were announced but have lain fallow for a year. Commitment=LOI. That is not an order. We have five known major sales campaigns in work. I hope Embraer lands a few. But the reality is the order book is thin which hurts the preceived value of any financed asset which hurts financing terms. So now is the time to sign new customers. But at this time I find it unlikely to have an E2-175 launch customer. I hope to be proven wrong by DALPA and discover that the current order is valid. I've asked contacts if the order was firmed. It isn't to the point production has been allocated. I hope you are right. My point is Embraer has a competitor that has sold well in 2018. Aircraft need economy of scale to be profitable. The Moxy commitment created buzz. Embraer needs a similar size order. The best analogy I have is the 717. It is still a really good plane. But due to being out manuevered by Airbus, leasing companies shyed away. In fact, Boeing still holds the leases to DL 717s! Volume is needed to create a reason market. I was alluding to how previously in this thread you dismissed the Moxy commitment. That one commitment allows the C-series to lino along for another year. My point is that Farnborough is critical for both programs. Only if Embraer sweeps all five known competitions is the C-series in trouble. Embaer needs to get the E2-190/195 over 300 sales ASAP to build confidence. I'd like to see at least six more airlines take up the type with over a hundred new orders. This isn't the E-jets as JetBlue gave the initial market confidence that quickly led to more orders. Moxie is good for months more C-series PR. The E2 EIS was excellent, let us see a big order. UA would be excellent. Even better, due to there range ravenous appetite for cheap used aircraft, DL (who has no known RFQ I purely speculate on how they could single handedly change the E2 fate, but DL is probably the toughest customer today as everyone tries to sell to them). The Embraer with E2 is in the same position as Bombardier was until Airbus steeped in the CSeries program. The correct question is: how big is the market where CS and E2 are inserted ??? Embraer E2: launched in June 2013, 3 models, 228 firm orders. Might be true, but then so is this . . .
To my knowledge the only thing firmed last year for the E2 at Paris was 10 undisclosed E195E2. Having said that I think Lightsaber is absolutely correct it's make or break, and if I were Embraer I think giving up the farm to land with Jetblue I think is particularly important. You've got to come out of Farnborough with 50+ (preferably morel like 100 +)orders at the minimum and one of those orders needs to be a Jetblue/United/Spirit. Until you're established in the market sometimes you have no choice but take less or no profit compared to what you'd like, ask Bombardier about Delta's order on that. But in reality it's those kind of moves that can save airframes from failing and Embraer needs one of those orders ASAP. I wonder if they have something up their sleeve for just prior to the show, I know you want to make a splash there but I didn't realize the asset it can be to announce prior to get momentum rolling as has been suggested above. You'd think a conversion of the 12 options Wideroe has and an announcement that the 195E2 is ahead of schedule (if those things come to pass) prior to the show might be a good way to set the playing field up for the show. Who knows but I can tell you I can't wait to see how it all plays out. I too cannot wait to see how it plays out. 50+ orders keeps Embraer on life support where they will need one more big order. A prime the pump order, such as Winderoe would be great, but not sufficient. Exactly. 12 to prime the pump would be great but if nothing ends up coming out of the pump by the end of the show they're still in trouble. I hope Embraer realizes that when you think you can't afford to go lower on an order only makes sense when it's an order you can afford to lose, there aren't anymore of those for a while if the E2 is going to make it. You've got to come out of Farnborough with 50+ (preferably morel like 100 +)orders at the minimum and one of those orders needs to be a Jetblue/United/Spirit. "JetBlue and Spirit Airlines in the US are known to be hot prospects. JetBlue won’t be ready by Farnborough, it said, to decide between the Embraer E-Jet E2 or the CS300. This decision is expected by year-end. Spirit’s timetable is unknown." "Keeping E190s remains an option for JetBlue: CFO"
I feel like we're stuck in the battle of the PR machines. I think for me I’m just going to wait it out and let the orders speak for themselves. I like both aircraft but there is an underlying current that doesn’t match up with the PR. So Four known campaigns to address at Farnborough. Spirit would be a huge win for Embraer. If Jetblue is open to the E2, then waiting until after Farnborough might make sense. If the CSeries makes a big splash then Embraer might get more aggressive on a deal. "Advertising may be the soul of business" but firm orders are essential. 12 months without a new order is quite ridiculous. I'm not criticizing the Embraer product, but the E2 weak sales that have been announced so far. - The 190 / 195E2 aircraft will be extremely competitive with competitors in terms of performance, CASM, maintenance and comfort. -He has a good customer base among the non-regional, more demanding airlines, something that BBD and Sukhoi lack. Expectations are very positive for Embraer in the different markets (commercial, executive and defense). Take some time to find out. Sit down and enjoy. I get all of the above, thats not my question and even EMBSPBR dodged my question. My question is despite all these positives, isn't it worrying that it doesnt have more orders? The "E1" got 1500 orders with 1400 delivered. The E2 has a combined total of 228 so far and 100 of them might never see the light of day. Airline CEOs are not stupid, they know this plane needs orders, they will underprice their offers or go Cseries its that simple. 3. Require a minimum of 3 years at full production rate or pay vendor penalties (there are ways to get around this, but it requires upfront investment where the airframer buys the machine tools and removes them from the vendor). 4. Minimum 1 year and 50% production as part of 'tail' for vendors to ramp down and put staff on other projects. Basically, take the backlog and divide by 5 and that is the maximum production rate an airframe can ramp to. Embraer does have 141 of the E1 jets in the backlog, so they have production as vendors ramp up E2 production. What Embraer doesn't have is a large firm E2 backlog. They have 63 firm orders for the E2-190 and 65 for the E2-195. So basically in process to ramp to 2/month? Embraer should have zero trouble doing that. Unfortunately, Skywest's HUGE order requires scope change to proceed. Now, I could be a pessimist, DALPA is going to set the terms (they are negotiating with DL right now). If DALPA allows heavier RJs, then the E2-175 receives a reprieve, if DALPA does not allow higher MTOW outsourced RJs... the unions at AA and UA will likely follow, and that is over half the potential market. There was a market for the 717, but it didn't happen. I hope the Embraer E2s break out. Unfortunately, this Farnborough is make or break for the E2. JetBlue is looking wise, if Embraer doesn't have a good Farnborough, they should be able to extract *outstanding* terms. 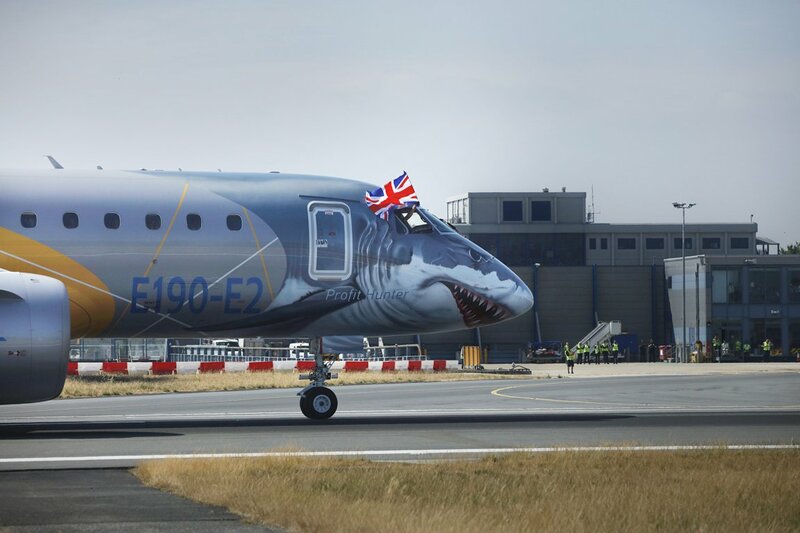 If Embraer does well at Farnborough, they will still be a tough customer. I'm curious if Spirit has the same strategy? Aerospace has brutal economics of scale. In general, if you double production, cost per unit drops 13% or so. The minimum production lot is 25 per year. Now, most items are built in multiples (e.g., engine pylons), but it will be tough for Embraer (and Bombardier) if they allow Airbus and Boeing to have such better economics of scale. e.g., Boeing is ramping to 57/month on the 737. Airbus has such an incredible production rate that they were able to start a new highly automated production line in Hamburg which will cut unit costs (although I'm highly impressed with what I've seen with the automation for the E2 production). I hope you are right and I'm being pessimistic. I simply have concerns on economy of scale and resale market (which impacts financing). Said exactly what I am thinking. Last edited by Samrnpage on Thu Jul 05, 2018 3:11 am, edited 1 time in total. An obvious fact that is less remembered is that Embraer shares the same line to produce aircraft as different as the Lineage 1000, 175/190 / 195E1, 175/190 / 195E2. Compare this with the BBD with the totally different models Q400-CRJ900-CS100 / 300. I understand that between 2015-2016, Embraer realized that the market would not appear so fast and decided to save capital and not increase installed capacity. It read the trends correctly. The market for 717 did not take off, it was outdone by E190 / 195. Customers are not dumb, they will look for the best aircraft and also competitive prices. But the A318 no longer exists, the A319 and 737-7 so far have disappointing sales. The performance advantage and early date of commissioning of the CS100 has disappeared. The cadence of production has dragged on for years without a conclusive explanation. Removing PW's difficulties should reveal internal difficulties that will require quite some time and money for the solution. I would be pessimistic if I believe there was a worldwide plot against E2. I think the contrary, 20 years ago the company grown from a very unfavorable position. Today's reality is a beautiful spring Sunday. If it comes down to it, once Boeing purchases Embraer, Boeing will probably sell the E2 at a loss or at cost if only to keep Airbus/the CSeries at bay (like Boeing did with the 737NG United deal for $22 mill each, if I remember correctly). Boeing has a large wallet, so it will only be a couple drops in the bucket for them to sell the planes at cost. Good opportunity for Boeing to do bundle deals I suppose. I get all of the above, thats not my question and even EMBSPBR dodged my question. according to the rules established in the forum, when you ask a personal question be prepared not to be answered. "The non-binding agreement proposes the formation of a joint venture comprising the commercial aircraft and services business of Embraer that would strategically align with Boeing's commercial development, production, marketing and lifecycle services operations. Under the terms of the agreement, Boeing will hold an 80 percent ownership stake in the joint venture and Embraer will own the remaining 20 percent stake." "The transaction values 100 percent of Embraer's commercial aircraft operations at $4.75 billion, and contemplates a value of $3.8 billion for Boeing's 80 percent ownership stake in the joint venture. The proposed partnership is expected to be accretive to Boeing's earnings per share beginning in 2020 and to generate estimated annual pre-tax cost synergies of approximately $150 million by year three." "In addition, both companies will create another joint venture to promote and develop new markets and applications for defense products and services, especially the KC-390 multi-mission aircraft, based on jointly-identified opportunities. "Joint investments in the global marketing of the KC-390, as well as a series of specific agreements in the fields of engineering, research and development and the supply chain, will enhance mutual benefits and further enhance the competitiveness of Boeing and Embraer," said Nelson Salgado, Embraer's Executive Vice President, Financial and Investor Relations." I just searched for this rule - couldnt find it but I will take your word on it. If you were not worried for the future of the E2 you would have just said "No not really"
I believe that it will gain traction. Boeing can offer bundle deals, and Boeing is also known for aggressive pricing when necessary, selling near the breakeven point (United Airlines $22 million 737NG deal). Boeing won't let their $4.6 billion investment die on the vine. Any rumors on any E2 orders for farnborough airshow? Now JB isnt one, who else is in the pipeline? Tell you what, United is a strong contender due to their links with Boeing. I think JetBlue was pretty much in the CSeries camp, and the Airbus investment put that decision over the top. I think United has probably been in the E2 camp, but the Boeing investment is a ways away. Someone else alluded to writing that involvement into a contract. Perhaps that will be what puts that decision for UA over the top. UA has a ton of 738s and a ton of MAX's on the way - do they need the A220 family? If not, then an E195-E2 might be just fine for them. I think Spirit could go either way, but they've seemed like a more logical CSeries operator. The Airbus investment may put that decision over the top as well. First, thank you. I missed you posted next deliveries. So I see enough sources that last year there were 10 orders. I see Airstana takes one in 2018. Is Somon air taking delivery in 2018? Hainin air might be some risk... But giving the benefit of the doubt, are any expected in 2018? I wish Embraer well at Farnborough. I believe I have already expressed the need for more orders enough in this thread. "It performed a demonstration flight over the volcano Kilimanjaro for Kenya Airways, which has a fleet of 15 Embraer 190s. As the largest E-Jet operator in Africa, Kenya Airways highlighted the E2’s arrival with a high-profile event attended by Brazil’s ambassador to Kenya, Fernando Coimbra. Coimbra described the aircraft’s trip as a “landmark moment” for the Brazilian co-operation with the airline." As the largest E-Jet operator in Africa, Kenya Airways highlighted the E2’s arrival with a high-profile event attended by Brazil’s ambassador to Kenya, Fernando Coimbra." Kenya is one of the 3 very interesting E2 vs. A220 competitions occurring this year (the other two are UA and Spirit). I really doubt any competition will be uncontested for years. Are there any other active campaigns? 02 Ago: Fuzhou (China) -> Fuzhou Airlines will be the first E2 chinese operator. 2 190E2 will be delivered up to the year end. (**) A spanish friend of mine told me that Binter Canarias may be the 195E2 unidentified spanish customer. What sales campaigns are underway? Binter Canaries would be a start. "The #EJets family continues to grow! Last week our highly skilled team completed the horizontal empennage of the next generation of #Embraer #E175, bringing us closer to a 2021 certification of the #E175E2. #EmbraerStories"
This is interesting. This is the first time in a LONG time I'd seen anything from Embraer indicating that the 175E2 wasn't just mothballed. Wonder if they've just decided to plow ahead, or if there is something we don't know. Seems odd to be building a plane with no customers, but it might be they figure they don't have time to redesign and to stave off the MRJ90 threat the right answer is to build the 175E2 as is and pray for scope change.